Flatstock Chicago & Pitchfork Music Fest: July 16-18, come say hi! Artwork by Flatstock artists Landland. For us, summer time means a lot of things, and one of them is what we like to call “carny season”. Yep. That’s right, I just called us carnies. We do a lot of craft shows and poster shows, aka Flatstocks all through the spring & summer and travel around the country to participate in them. And? We love it. One of our favorite shows is coming up this weekend, hooray! It’s the Chicago Flatstock 26, which happens during the super dupes Pitchfork Music Festival in Union Park, smack in the middle of Chicago. We’ll be there showing a giant new crop of posters and Test Prints as well as art prints and more. So please say hello when you drop by Flatstock! We love meeting new folks at shows, big time. Pitchfork Fest’s line up is seriously kickass this year, and even cooler, Flatstock 26 Chicago is 3 days long now too running from Friday July 16th through Sunday July 18th. While the Flatstock Poster Show is free and wide open to the tens of thousands of Pitchfork Festival attendees, you do need a ticket to attend Pitchfork Fest. The Flatstock Poster Show series is presented by the American Poster Institute (API), of which all Flatstock artists are members. Flatstock is an ongoing series of exhibitions featuring the work of many of the most popular concert poster artists working today. Most posters and the rock poster artists who show at Flatstocks are working in the silkscreen mediums, often using hand printed techniques and are working for current bands and musical artists. 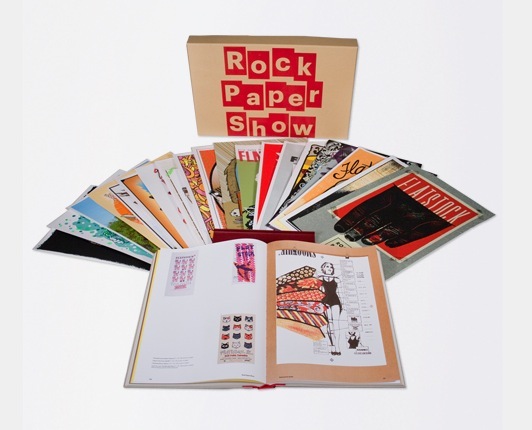 To learn more about Flatstock Poster Shows, click here! Our Rock For Kids live webcast Poster Artist Interview rescheduled for 6/17, hooray! Tune in on Thursday June 17th at 3pm EST (2pm CST & 12 noon PST)! Click this link to watch & get more info about our live strawberryluna / Hero Design Studio webcast interview! So, it’s back on and it’s going to be a blast. Myself (hellooooo strawberryluna, silly) and our friends at Hero Design Studio have teamed up with the fine folks at Rock For Kids & Clay Hayes from Gigposters.com as a part of the Rock For Kids live webcast Poster Artist Interview Series. Click this link here to watch the interview live at Vokle.com. Also! In support of the fantastic work that Rock For Kids does, we are proud to announce we’ll be donating 20% of our online sales to Rock For Kids from Thursday June 17th to Friday June 25th. Help us help Rock For Kids! We will be taking questions from anyone & everyone who is participating in the webcast, so log into Vokle.com to be able to ask away. Or, if you just want to watch the interview live, there’s no need to log in, just watch the stream. Though let’s be honest, interacting is more fun than just watching. Right? Me, aka strawberryluna will be interviewing Hero Design, and vice versa, as well as answering your questions too. It’s gonna be fun. So, set your watches, calendars, egg timers and sun dials and tune in for our turn in the Rock For Kids & Gigposters.com organized Poster Artist Interview Series. All of the interviews are being webcast live, via Vokle.com. Jay Ryan – on Wednesday, June 2 @ 1PM CST – you missed it! Geoff Peveto / Decoder Ring Design Concern – on Monday June 14 @ 7PM CST – you missed it! GigPosters.com was created and is maintained by Clay Hayes who resides in Calgary, Alberta, Canada. The website launched in January, 2001. Showcasing the worlds largest historical gig poster archive, this massive online art gallery is home to thousands of designers from around the world. Visitors can browse and comment on gig posters, join the large community in the forums, chat, and purchase posters in the classified ads section. 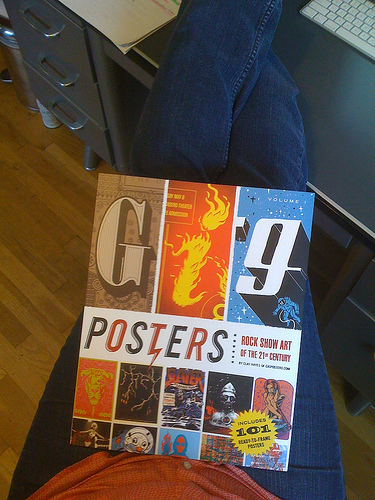 In 2009, GigPosters.com founder Clay Hayes also authored a groundbreaking book, Gig Posters Volume 1: Rock Show Art of the 21st Century (<— availble at this link) published by Chronicle Books. Since 2001, Gigposters.com has been the Internet’s first and best resource for rock-show poster art; their massive online database showcases more than 90,000 posters from 7,000 different designers, including all of today’s top poster studios. Gig Posters Volume I highlights the 700+ best examples in their collection, including 101 perforated and ready-to-hang posters for bands such as Radiohead, Wilco, the Decemberists, the Shins, Arcade Fire, Sleater-Kinney, and more. Among the many designers contributing to this collection are Rob Jones (of White Stripes fame), The Decoder Ring (house artists for Modest Mouse), Patent Pending, Tara McPherson, strawberryluna, Hero Design, and more. 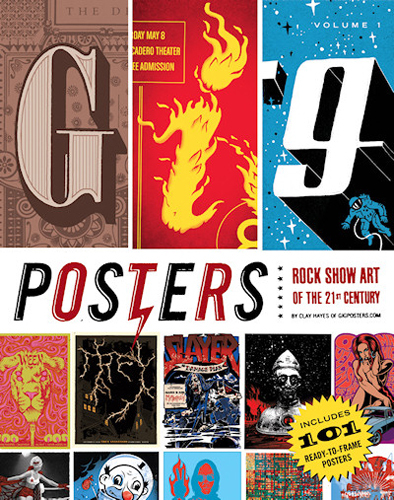 Packaged in an oversized 11-by-14-inch paperback, Gig Posters Volume I is a spectacular compilation of rock show art (and one hell of a cheap way to decorate a dorm room or apartment). Rock For Kids is a non-profit organization that provides support, hope, inspiration and assistance to underserved children and teens. Realizing that music can be a positive motivator in a young person’s life, Rock For Kids provides free year-round music education for children in need. Rock For Kids positively impacts and celebrates young lives by offering access to safe and constructive learning experiences through which children may challenge themselves, build self-esteem and explore their own creative potential. Realizing that music has the power to transcend challenging situations and transform lives, we envision a community inspired by its youth as they develop self-esteem and confidence through access to music education. We believe children can inspire their own families, become leaders among their peers and take on the world as well-rounded and motivated individuals. We are so sorry to announce that this interview has been postponed due to multiple technical difficulties. We’re super sad, at the same time, we all know that the rescheduled event will be amazing and totally worth the wait. Stayed tuned for the rescheduled date, which will most likely be next week June 10th or 11th. Also! In support of the fantastic work that Rock For Kids does, we are proud to announce we’ll be donating 20% of our online sales toRock For Kids from Thursday June 10th to Friday June 18h. Help us help Rock For Kids! We will be taking questions from anyone & everyone who is participating in the webcast, so log into Vokle.com or watch the interview live via the viewer below, and ask away! strawberryluna will be interviewing Hero Design, and vice versa, as well as answering your questions too. It’s gonna be fun. More about the very rad Rock for Kids: Rock For Kids is a non-profit organization that provides support, hope, inspiration and assistance to underserved children and teens. Realizing that music can be a positive motivator in a young person’s life, Rock For Kids provides free year-round music education for children in need. Rock For Kids positively impacts and celebrates young lives by offering access to safe and constructive learning experiences through which children may challenge themselves, build self-esteem and explore their own creative potential. Realizing that music has the power to transcend challenging situations and transform lives, we envision a community inspired by its youth as they develop self-esteem and confidence through access to music education. We believe children can inspire their own families, become leaders among their peers and take on the world as well-rounded and motivated individuals. Gig Posters Volume 1: Rock Show Art of the 21st Century, new book! Freshly published and totally incredible. I’m so proud to be a part of this rad book, as is taken from the imaginations of, and containing the work and words of 101 working, contemporary and kickass rock poster artists from around the globe. All compiled into a nifty book format. Just for you! Each poster artist talks about their work, influences and process as well as providing a full page format, perforated page tear-out poster. It’s a lot of awesome, and not just because I’m in it. In fact, I would venture to say despite the fact that I’m in this book. Directly from me, at my website here, NOTE: personalized and autographed by me, just for you, with a bonus set of stickers, over 15 designs in all. Directly from the publisher, at Quirk Books here. Directly from the publisher, at Chronicle Books here. 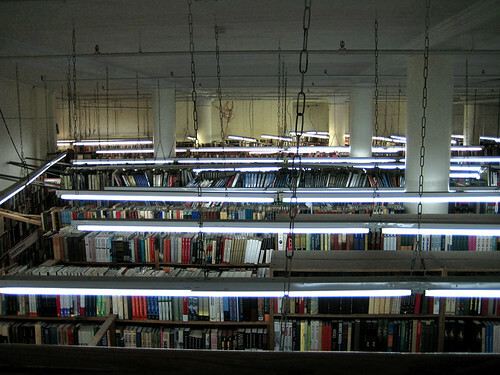 Publisher’s description: 11×14 inches, paperback, 208 pages. Since 2001 Gigposters.com has been the Internet’s first and best resource for rock-show poster art; their massive online database showcases more than 90 000 posters from 7 000 different designers including all of today’s top poster studios. Gig Posters Volume I highlights the 700+ best examples in their collection including 101 perforated and ready-to-hang posters for bands such as Radiohead Wilco the Decemberists the Shins Arcade Fire Sleater-Kinney and TONS more. Packaged in an oversized 11-by-14-inch paperback, Gig Posters Volume I is a spectacular compilation of rock show art (and one hell of a cheap way to decorate a dorm room or apartment). Author Clay Hayes is the founder and proprietor of Gigposters.com. He lives in Alberta, Canada. Thoughful oversized, yet conveniently lap-fitting dimensions of the new Gig Posters Vol. I book by Clay Hayes. Gig Posters Volume I, big ol’ awesome BOOK! Available for pre-order now, published through the super Chronicle Books and Quirk Books. And, just an FYI? If you pre-order through the Gigposters.com website you will receive a bitchin’ extra freebie: an exclusive screenprinted poster from the indomitable Jay Ryan. No foolin’! Includes 101 perforated and ready-to-hang posters along with hundreds of other poster images and designer biographies. Packaged in an oversized 11-by-14-inch paperback, Gig Posters Volume I is a spectacular compilation of rock show art (and a great way to decorate a dorm room or apartment).